As before, here are some of my favourite photos from Mana Pools, Zimbabwe. Enjoy. 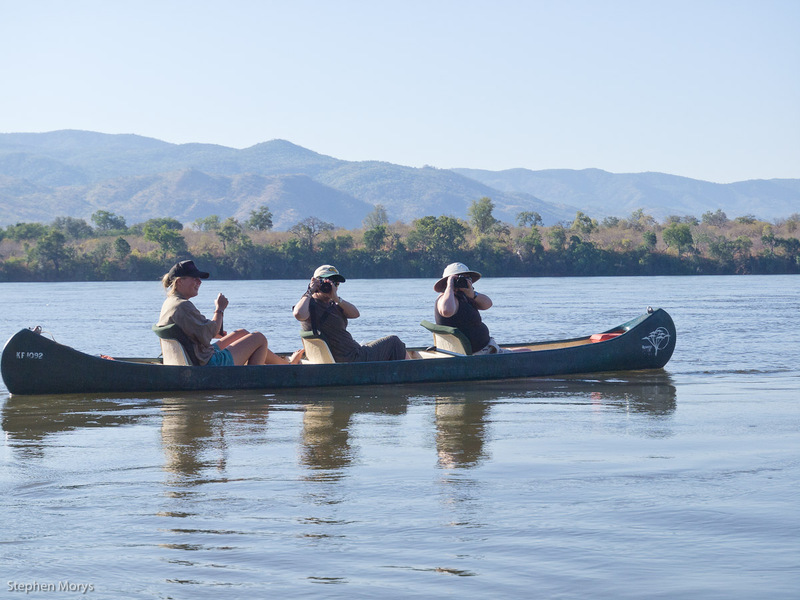 Most of our time in Mana Pools was actually spent in canoes. This was a fantastic way to experience the Zambezi River. 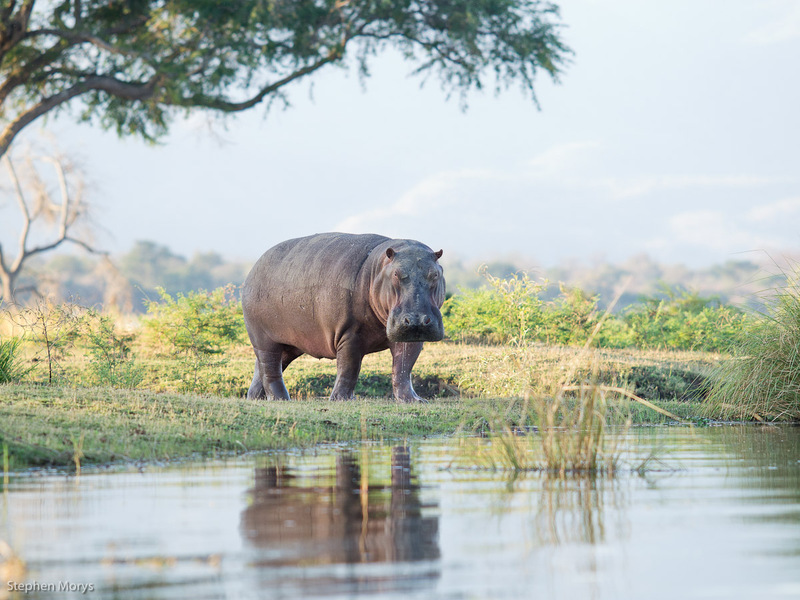 The one animal that has done extremely well in this area is the hippopotamus. I must admit I really had little knowledge of this animal. Boy, were we going to get an education. 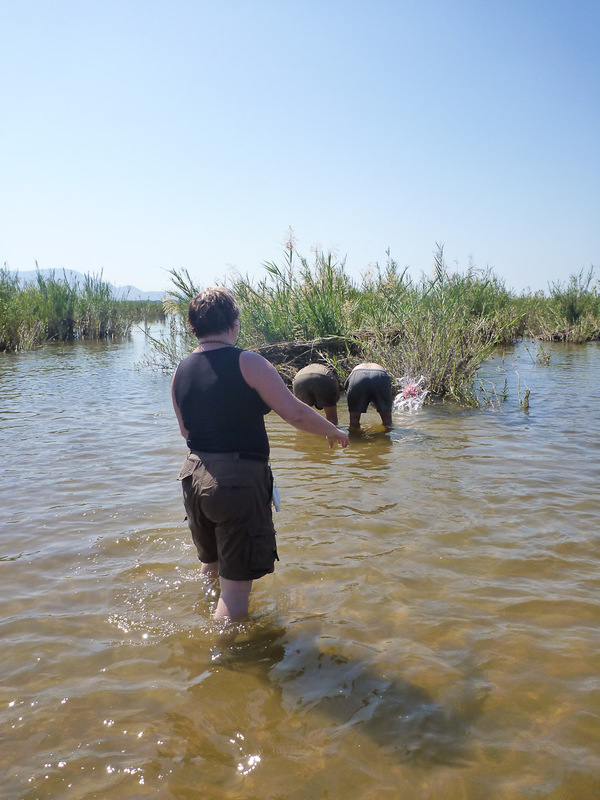 There were hippopotami everywhere. I mean everywhere. According to Nick there were approximately 5000 hippopotami in this area. I think we saw all of them. Most people think of hippopotami as ugly looking and they are often portrayed as comical animals. Nothing could be further from the truth if they are angry. Mothers are extremely protective of their calves. 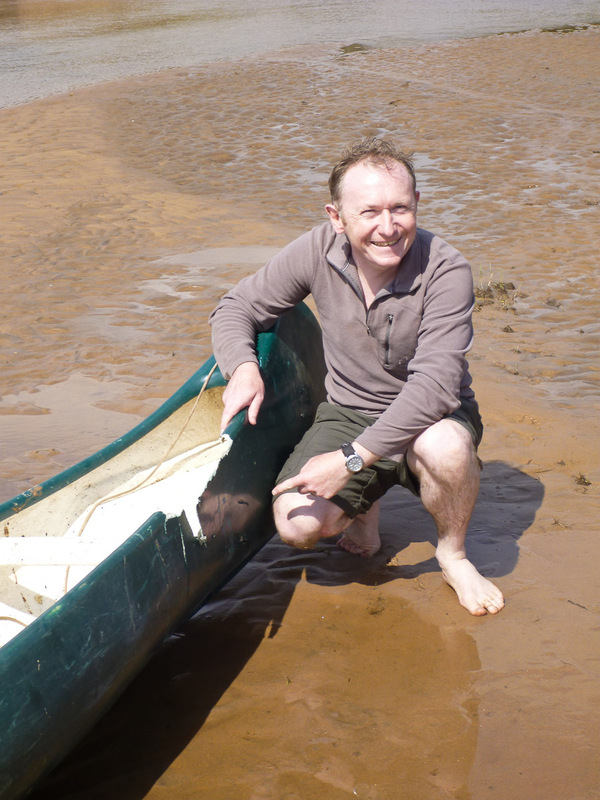 This was a time that we were required to paddle furiously to assist our guides. We had no problem with this. We were educated that they are actually extremely anxious animals and often are very reactive based on fear. We had a fascinating study each day on how not to elicit this behaviour by our guides. They were extremely adept at observing their behaviour as we approached them and the trick was to read their behaviour and always give them space or access to deep water in which case they preferred to avoid you. In the water hippopotami only keep their eyes and the top portion of their head visible. Then they suddenly disappear and this is when you need to worry. They can stay underwater for between 10 to 20 minutes at a time. With the glare on the surface of the water they are completely invisible when submerged. Most incidents occur when they suddenly breach. If this occurs beneath your canoe you will be overturned. Most of the fatalities occur because unbeknownst to us most Africans do not know how to swim. They usually drown after being overturned. On rare occasions you can get a predatory hippopotamus which purposely overturns your canoe. This is a frightening experience. Hippopotami have huge teeth and are quite capable of simply snapping through the fibreglass canoes. On one of our particular canoe outings we were gently paddling through the Zambezi. It had been a hot afternoon and we were all quite relaxed. Richard and Danni were in the last canoe. We had just passed a particular pod of hippopotami. We later found out that Richard and Dani had just been talking about how uneventful our paddling experiences had been up to that point and how lucky we had been (Richard had been in Africa on this exact adventure approximately a year ago when he had witnessed a hippopotamus attack on a canoe in front of him. It had made quite an impression on him). Little did he realize he was about to have a similar experience. I remember suddenly hearing a yell followed by a huge splash. As I looked behind I saw their canoe overturned with Dani calling out to Richard who was separated from the canoe but amazingly was holding his very expensive camera above his head and paddling with one hand crazily to get back to the canoe. They apparently had been overturned by a very angry and predatory bull hippopotamus who was known to be prone to this type of behaviour. Dani, our most inexperienced guide, did a superb job of handling the situation. 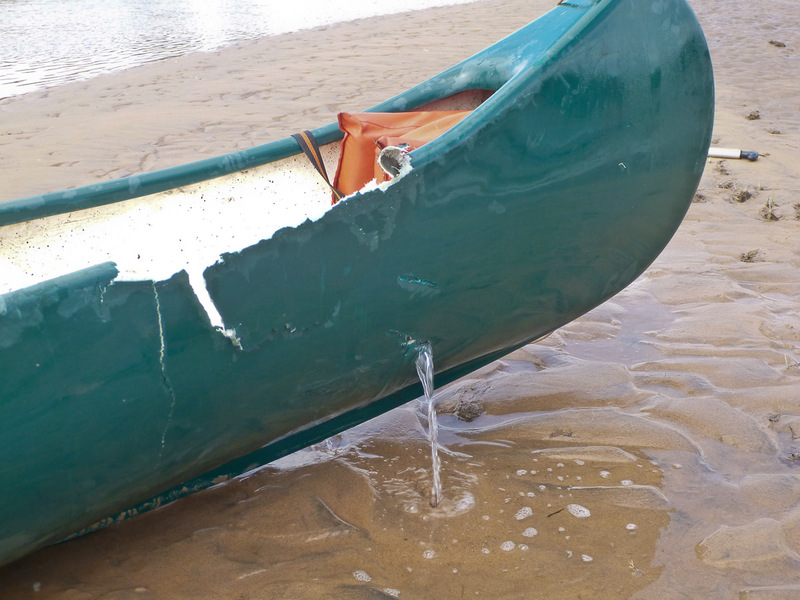 The back right-side portion of her canoe had been damaged and bitten through by the hippopotamus. However, she and Richard emerged unscathed. We were even able to joke about it afterwards. Nick was most impressed that in this situation Richard was able to keep his camera from getting submerged at all. It was in perfect working order. Unbelievable. Nick shook Richard’s hand. Richard seemed to be upset that we did not capture this experience by video. We almost beat him senseless. Certainly capturing the experience was the last thing on our minds. It is hard to suppress an overwhelming urge to dive in and swim towards the capsized canoe. This is definitely not the thing to do. Nick instructed us to paddle our canoes and create a protective wall around the overturned canoe and individuals until we were able to right the canoe and get them back in. We paddled to a close sandy island and called back to the main camp to get a new canoe as this one was damaged and would not be able to continue with us on our adventure. I must admit we had to think a little about whether we wanted to continue. After reflection we decided it was best that we should. Unbeknownst to us Dani’s parents- who had come up for several days to spend time with her- had been actually following in a vehicle along the shoreline. They witnessed the whole thing. Later Dani told us that her parents were somewhat concerned with her choice of occupation from a safety point of view. I am not sure this experience helped in that regard. We continued on our way and I am happy to report that we had no further such experiences for the remainder of our time. I still recall the paddle on our final day. One always becomes sentimental on the final day of any journey. This day was particularly warm and after paddling for a couple hours in the morning suddenly all three canoes were stopped. We were in a beautiful sandy and reedy area with no hippopotami in sight. We were suddenly informed that it was time to go for a swim. I was all for it. I was feeling a little overheated at that point. Suddenly Nick produced a small soccer ball and informed us that we would be playing “Pig”. The purpose of the game is to pass the ball along as quickly as you can to other members who are standing in a circle. If you dropped the ball or threw it poorly you were awarded one of the consonants of the word pig. After three misses or poor throws you spelled the word “Pig” had to bend over exposing your backside and then the other players got to throw the ball at your backside. If they missed they joined you. After all members had thrown you started all over. What a great game. We played like little children for about 45 minutes. A great time was had by all. We then got back into our canoes and paddled back to our final campsite. We simply drifted for the last kilometre to fully enjoy our final paddling adventure. The light was beautiful as the sun was setting on the Zambezi. There was no wind and the water was like glass. We were all in heaven. What a great way to finish off our Mana Pools safari. I think we will all remember that final kilometre forever. June 21 the next morning we said our goodbyes to the camp staff, Danni, Tanya, the children, Nick and Desi. We were transferred to a nearby dirt airstrip for our Wilderness Air scheduled charter flight back to Victoria Falls Airport. The African Safari adventure of our travels was over. We then boarded a charter flight back to Johannesburg. At this point we said our goodbyes to Teresa and Richard. Teresa was heading back to Calgary with two overnight flights. We gave her our condolences. Richard was proceeding back to England to spend some time with his parents before heading back to Calgary. It was hard to say goodbye after all of our wonderful experiences. Anna and I were proceeding onwards to spend 10 days in Cape Town. As I mentioned previously, the experience in Mana Pools was different in terms of animal sightings compared to Botswana. We saw a lot less animals on our game drives. However, two experiences in particular were interesting. As we were looking for animals to photograph one morning suddenly Nick stopped the truck and said I can see lions in the distance. Guides must be provided with different spotting skills compared to ours. We seem to be adept at only spotting Starbucks locations. We could not see what he was looking at. He instructed us to get off the vehicle and get ready to track the lions. Surely he must be kidding! He cocked his rifle and off he went with us in tow. 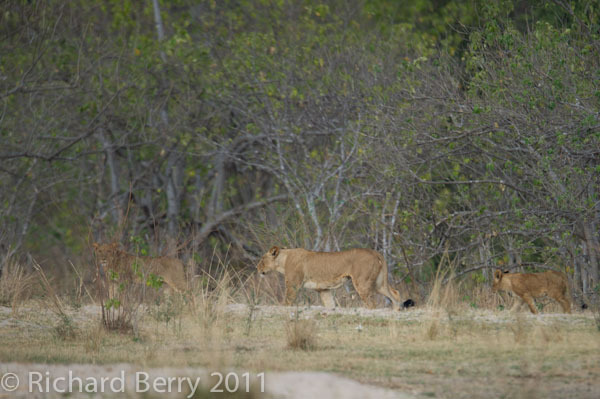 After walking for a while suddenly we saw a pride of ten lions walking along the edge of a sandy rut. It was amazing he had spotted them from the track. We proceeded into the bush to see if we could get closer. 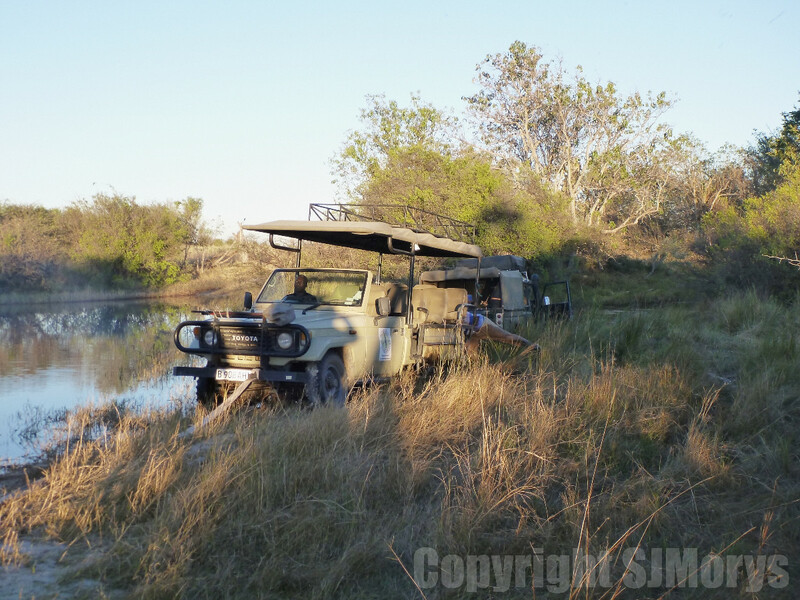 The bush was relatively thick and Nick frequently looked at the tracks in the sand to get a bearing on the lions. He kept pointing out the footprints and clearly describing how many lions and in what direction they were traveling. We kept agreeing with his assessment but for the life of us had no idea what the dirt was trying to tell us. I must admit I did poorly in tracking during my studies in Canada. Unfortunately, after approximately 30 minutes, we decided the lions had given us the slip and we proceeded back to the vehicle. We were not unhappy with this outcome. On another day, we again drove out from our mobile camp stopped the vehicle and then started to proceed through the bush. 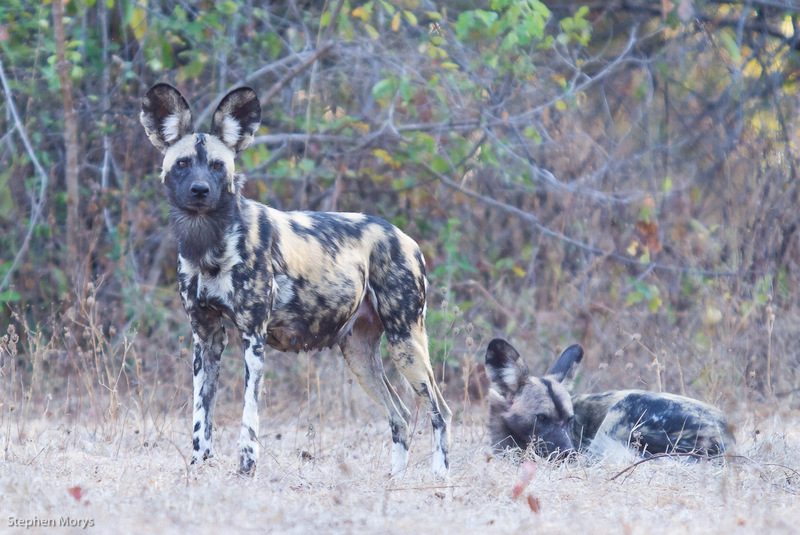 Nick was aware of a pack of wild African dogs in the area. These are the rarest African predators and are endangered. We certainly had an experience in Botswana to observe them but with at least eight other vehicles this detracted from the experience. If we saw this pack we alone would be present. We were all very excited. After 15 minutes Nick suddenly stopped as he had spotted the pack. There were approximately 8 dogs leisurely sitting in the sunshine. In order to get closer he instructed us to get as low to the ground as possible. The dogs must have been smiling as six of us slowly creeped towards them on our buttocks through the dirt trying to miss their droppings. This however allowed us to get quite close to the dogs and get some great photographs. This was the den site of this particular pack and apparently there were three puppies present. We did get a chance later to walk close to the den site but it was extremely well protected and camouflaged and we never did see the puppies. What a special experience. It really pays to have a professional guide. As we arrived June 17 at the airstrip we were greeted by Nick Murray our 42-year-old professional guide from Zimbabwe. 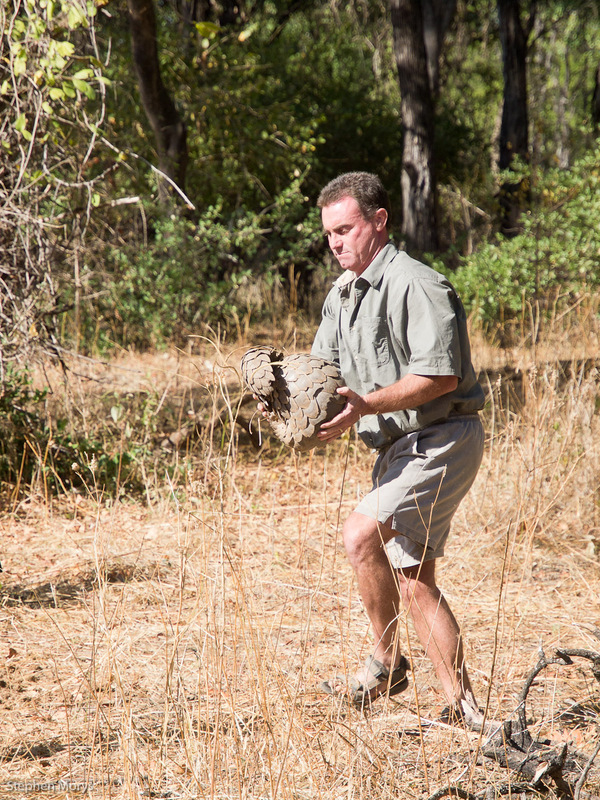 Nick was born in Zimbabwe and attended university in South Africa where he graduated with a BSc in Zoology. 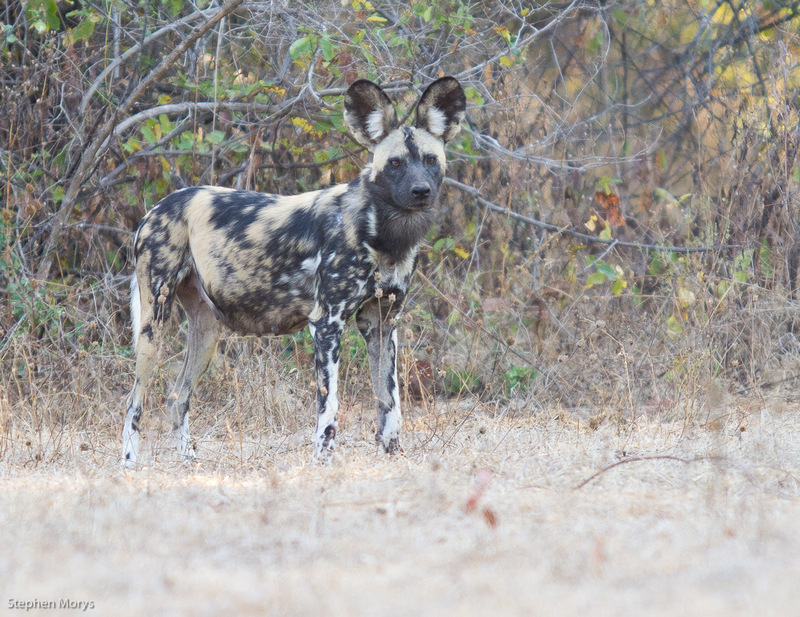 He informed us during this trip that he was working on a Masters degree based upon the local wild African dogs. We were lucky that a pack was present in the area and we had a good chance of observing them in their natural environment. He has guided throughout Zimbabwe and had toured Mozambique, Zambia, Botswana, Namibia, South Africa and Tanzania. He is very experienced in wildlife management, game ranching and game capture. From 1995-1998 he was a freelance guide in various lodges and camps in the Kariba, Hwange and Mana Pools areas. 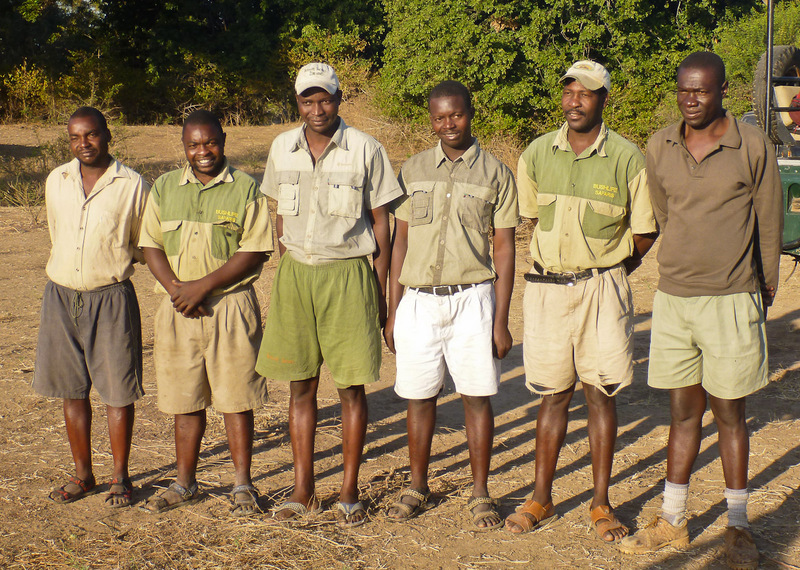 Nick is now based in the Zambezi Valley at Vundu Camp which is the only semipermanent campsite in Mana Pools. The main lodge is set in a canopy of riverrine trees on the bank of the river. It is raised 10 feet off the ground with a thatched roof and was definitely an ideal place to enjoy our dinners and cocktails. On-site accommodation included eight large tents again with en suite showers and flush toilets. This would be our home for the next two days. We were very lucky the first night when we were informed by other guides that a Pangolin had been spotted so we ventured off in a flurry to look at this prehistoric looking animal. It is extremely rare to see this elusive animal. Nick had not seen one in 15 years! This camp experience was going to be different than the one we had in Botswana. We were certainly going to do game drives but the focus here would be on canoeing the Zambezi River for a good portion of our time. In addition to Nick (and Desi, his wife and also professional guide as well as his two adorable children Tate and Jed), we also had two female guides in training- Danni and Tanya- who would assist him with guiding individual canoes. For our outings we would use three canoes-one canoe with three people and the other two with two. In most cases we were not required to paddle except in certain circumstances. I will come to this. You may not realize how extensive the training is to become a professional guide. The entire process takes up to five years. The breadth of knowledge they must acquire is extensive. Usually guides in training will be mentored by a professional guide such as Nick. For the first two days we would be based out of Vundu camp and then the following two days we would travel to two different mobile camps. Again, our itinerary was consistent. We usually got up at 5:30 AM with a light breakfast and coffee and then went on a morning game drive. We would return to camp briefly and then prepare for our canoe trip. We usually had lunch at a beautiful rest stop along the shoreline during our canoe trip. We did not have the two-three hour break in the middle of the day that we had in Botswana. We would usually arrive back in camp late afternoon or early evening, shower, and then sit down to a wonderful meal followed by sitting around the camp fire regaling our adventures of the day before going to sleep. One does not realize how many individuals it takes in order to run a remote camp. In the background we had six staff responsible for providing for our needs. They were always extremely polite, efficient and made us feel like we were at home. This left us to focus on experiencing the landscape and concentrating on photography. This is the only way to see wild Africa. It was very difficult to leave Botswana. 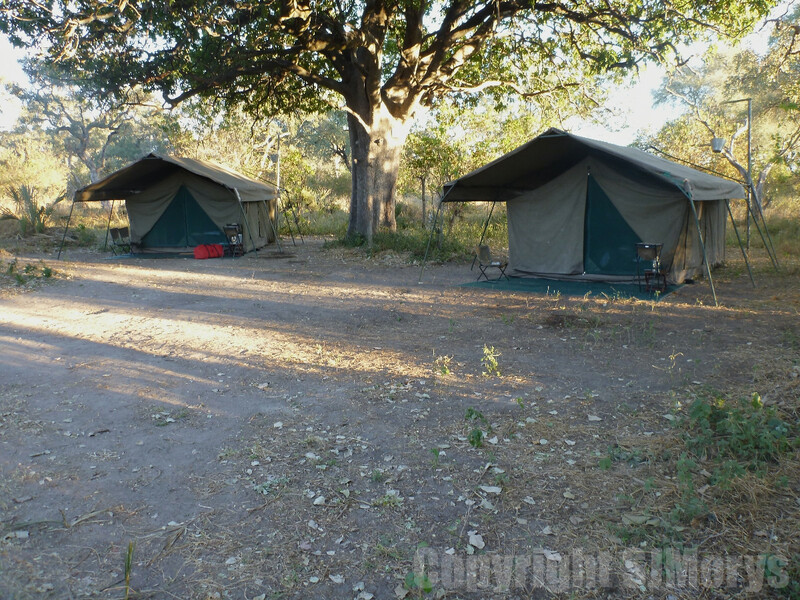 We had such a great time in both the Okavango Moremi Game Reserve and the Khwai Concession camps with Brian and Capture Africa. It was now June 15 and it was time to depart on a scheduled charter by Mack Air to Kasane Airport. Our pilot this time was Paul and Teresa was able to sit up front beside Paul as co-pilot which was something she had not experienced before. She really enjoyed this although perhaps a little too much. Once we landed she seemed rather upset that Paul had refused to do a barrel roll of the plane during our adventure. Something about regulations. We were able to fly the entire way at low altitude of approximately 500 feet. The plane was larger than the first one. Once we landed, we departed by bus and drove onwards towards Victoria Falls. We had to pass two checkpoints one of which belonged to Botswana and the other to Zimbabwe. It was clear sailing through the Botswana checkpoint. We knew we were in a different country when we stopped to purchase our visas at the Zimbabwe checkpoint. You already had a different sense about the country. There was one line to purchase your visa but then you have to stand in another line in order to get your visa. Apparently one person is not capable of doing the two things. We also discovered that Canadians pay $75 US compared to British citizens who pay $55 US and other countries pay $30 US. I had a good chuckle about this with another tourist who was from Belgium (by the way he paid $30 US). However we learned that if you purchased your visa overseas in an embassy as a couple you would pay $250 US! We stopped complaining. We finally drove in to Victoria Falls named after Queen Victoria by David Livingstone who was the first European to discover the falls. It is also known by the name Mosi-o-Tunya or the “smoke that thunders”. As we were about to find out this is a most appropriate name. The falls are one of the seven natural wonders of the world. They are also the largest with a width of 1708 m and a maximum height of 108 m. We were staying at the Victoria Falls Hotel which is one of the best hotels in Zimbabwe or Africa for that matter. It is a beautiful hotel in colonial style with landscaped grounds. After we were greeted with a freshly scented refreshing cloth, we checked in and immediately proceeded to have a great lunch and our first Zambezi beer (many more to come) of the trip with distant views of the falls. Anna would arrive soon. We were all thrilled when shortly thereafter the smiling face of Anna appeared. Previous to joining us she as well had also visited London and Johannesburg. She had flown in from Johannesburg that morning and was joining us for the Victoria Falls and Mana Pools, Zimbabwe portion of our safari adventure. We were happy to hear that nothing had been removed from her suitcases. The stay at the Victoria Falls was meant to break up our adventure and also enjoy some traditional luxury. We then proceeded on to our guided tour of Victoria Falls with our very knowledgeable guide Esther Gwekwerere. Apparently she has been living in Victoria Falls and guiding for approximately 35 years. She could answer any question you had about the falls. She was also very eager to let us know that she had accomplished numerous bungee jumps. We were all suitably impressed and thought if she can do it why can’t we? Esther must’ve been in her mid-60s. The Victoria Falls railway bridge has the second-highest bungee jump as an attraction. After her proclamation we were all ready to sign up. It is hard to describe the falls adequately in this blog. It is simply something that you must experience. The roaring sound, the spray and the size is almost overwhelming. So much rain ricochets off the gorge that the surrounding vegetation is rain forest in character. It is absolutely breathtaking. The government has built a park with a lovely walkway that gives you many views of the different gorges that make up the falls. It is well worth doing if you come. The end of the pathway faces the aforementioned Victoria Falls railway bridge where we were able to witness an individual bungee jumping. After witnessing this we had even more respect for Esther. At this point however she informed us that her definition of bungee jumping was simply watching others do it. We all had a good laugh. We would not have to bungee jump after all. Teresa and Anna were especially relieved. We returned to the hotel and had a lovely buffet dinner outside entertained by several groups of local African dance artists. What a lovely way to end the day. We retired early as we had an early morning photography shoot at the falls. We had to be at the park gates by 6 AM. Even though you could walk from the hotel to the park gates this was strongly discouraged as elephants roam freely within the town of Victoria Falls which is found in an unfenced game reserve. We were shocked when Esther advised us that two locals had been killed within the last week by elephants. We were quite happy to take a cab. We arrived at the falls the next morning ready to get our award-winning shot. We were sure we could do it better than anybody else had. Boy were we surprised. The flow through the Zambezi River has been extremely high over the last two years. Also, the spray from the falls is at its maximum in the morning due to the wind. It was pretty much impossible to get a clear shot of the falls because the spray only cleared for less than a second. Then the falls would completely disappear. In our attempts we all became completely soaked. We do not have one good photograph to share. We agreed we would not attempt to do this again the next morning as we had planned. We returned to the hotel as we had decided that we would do a helicopter tour of the falls that day. This is a great way to get a unique vantage point of the entire falls and the Zambezi River. We really appreciated the size of the falls and the flow through the Zambezi River. On our way back we asked to be dropped off in Victoria Falls (just to be clear after the helicopter had landed) to do some shopping. Victoria Falls has many markets and shops that sell unique African curios. The prices were much more reasonable compared to what we saw in Johannesburg. Many gifts were picked up but I must admit we started to wonder how we were going to pack all of them for our trip back home. We agreed to worry about it later. When we returned to the hotel we decided to go poolside and do the tourist thing. The weather was actually quite warm but for most locals it was much too cold to lay by a pool. Richard and I decided to go for a swim. It was a great place just to relax which we did for several hours. That evening we got dressed up in our best safari gear and had dinner at the famous Livingstone room restaurant in the Victoria Falls Hotel. This is a very elegant restaurant with a strict dress code. Philip (our maître d’ who apparently had the poshest English accent Richard had ever heard outside of London) looked rather disapprovingly at Richard who only had a short sleeved shirt. Richard protested that he had cleared this type of shirt when he booked the reservations. Grudgingly, albeit with a smile, Philip let us in. The room was absolutely stunning and the service was impeccable. We decided on the chef’s special of 6 courses with a wine pairing with each course. What a fantastic meal. After some great conversation we decided to retire to our rooms to pack for our upcoming adventure to Mana Pools. We were limited by how much weight we could bring on the next plane so we decided to leave a bag with gear we were likely not to use. We fell into a peaceful slumber dreaming of the next safari adventure. The following day, June 17, we were transferred to the Victoria Falls Airport for our Wilderness Air scheduled charter flight to Mana Pools. With each flight our airplane was getting bigger and more comfortable. This was a trend we were appreciative of. Nick, our pilot, delivered us uneventfully to another dirt airstrip just off the Zambezi River. We were ready for our next safari with Nick Murray our Bushlife/Vandu Camp Guide. In this post I promise to be less verbose and more visual. I have included some of my favourite photographs from the Botswana section of our Africa adventure. Enjoy! 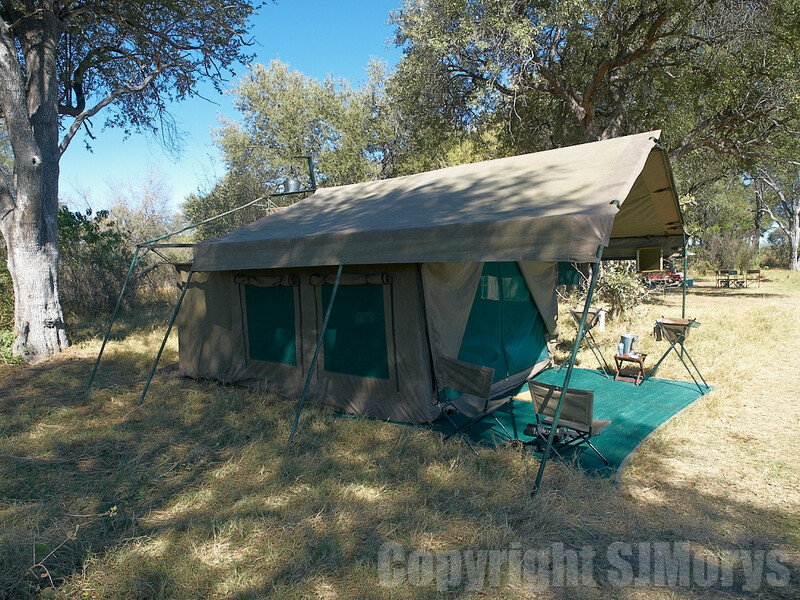 I thought I would describe mobile tenting to you so you would understand how we actually experienced Botswana. 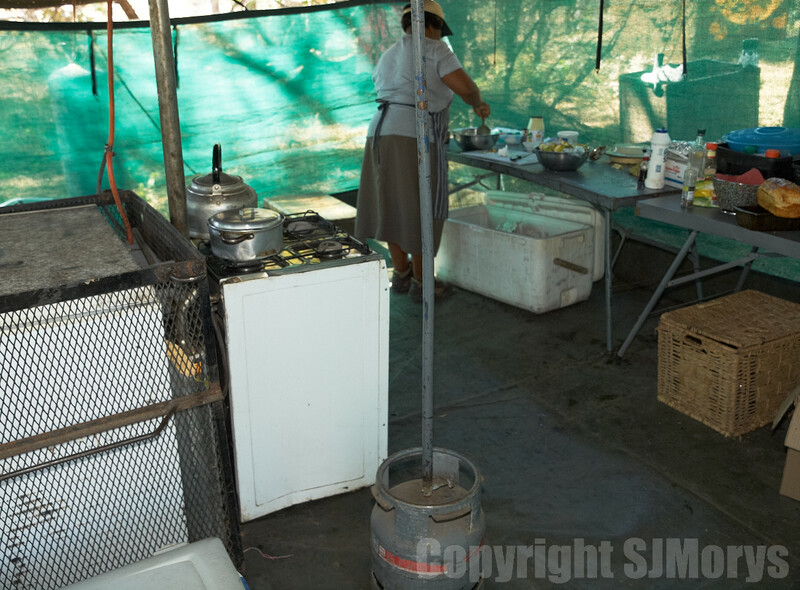 We were provided luxuries in camp but were still very close to the land. One was able to absorb the awesome, majestic grandeur of the African landscape and its wildlife. To us it seemed the best compromise. We were not that interested in staying in luxury lodges or necessarily completely roughing it. 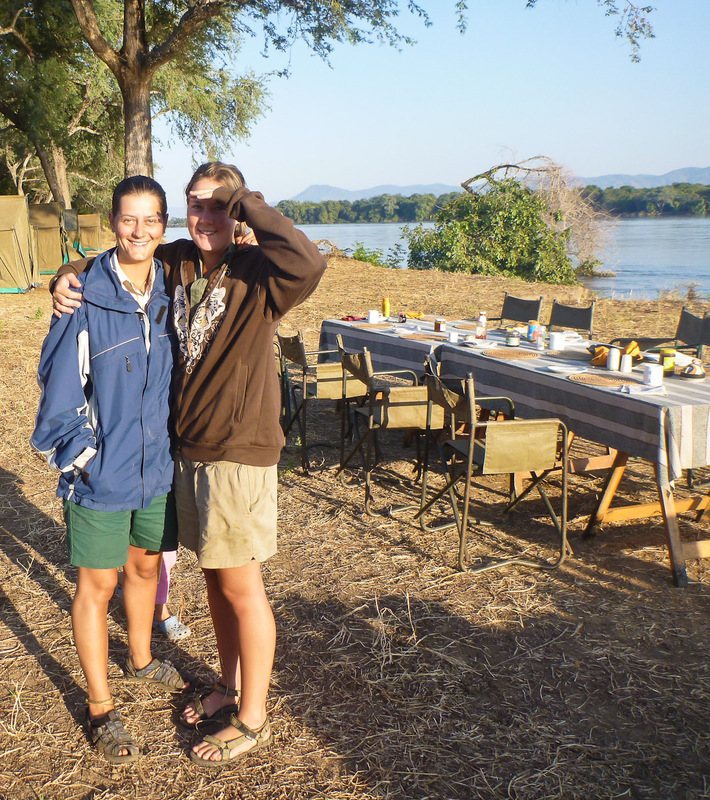 The mobile camp site was private and led by a truly professional guide. He was completely interested in making sure you had a real wildlife experience. 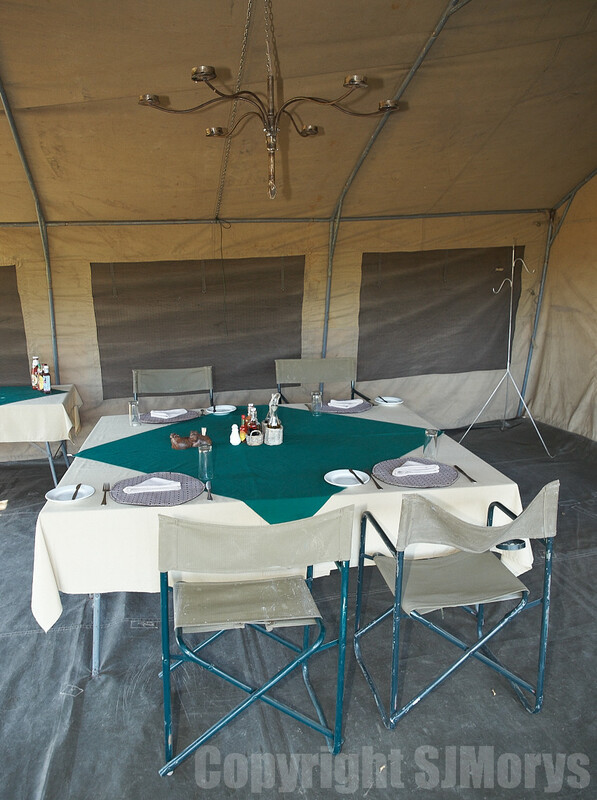 The tents were 12 x 16 feet, with insect proof windows, comfortable single cots with fresh linens and duvets with private verandas. There was also a private attached en suite bathroom tent with a separate hot water shower and pit toilet. We were fortunate in that we were the only three in our two mobile camps so we received personalized service. It was winter in Africa so the temperatures were cold in the morning (the first morning we had frost) but warmed up to the mid-80s in the afternoon. There were fewer mosquitoes and the temperatures were much more conducive to touring as opposed to mid-40°C temperatures typically experienced in summer. One of the nicest surprises we had was climbing into our beds the first night to discover a hot water bottle to make our sleep more comfortable. What service. Our daily itinerary was consistent. Wake up time was 6 AM. Wash basins were placed outside the tents with hot water to freshen up before we begin another day of adventure. We usually had breakfast before we departed. After our morning game drives we returned to camp with refreshments and freshly baked goods and then rested until a superb lunch was served. Because the temperatures were quite warm and there was little animal activity in midday you would stay in camp for approximately 3 hours prior to the afternoon game drives. You were not allowed to go outside the confines of the camp due to the risk of animal attack. This was a bit of an adjustment for me but it did force me to relax and enjoy the experience. 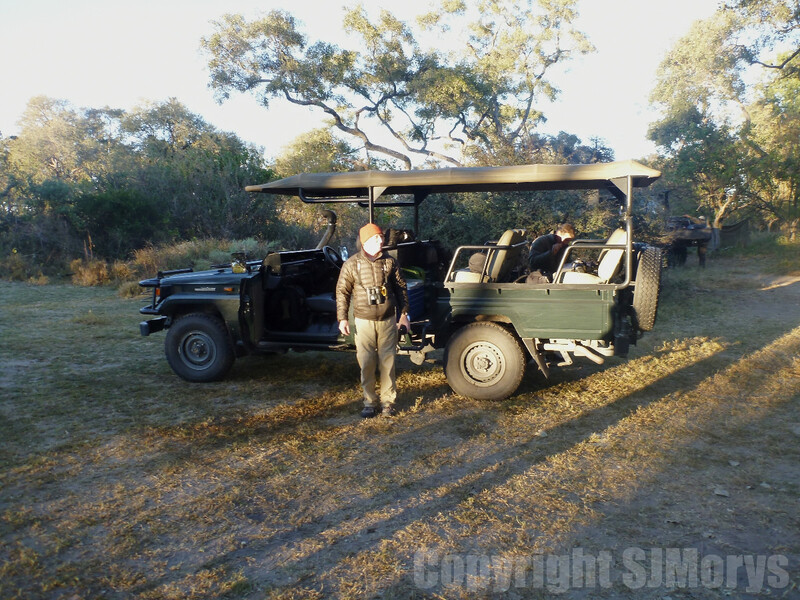 Usually during our evening game drives we would stop for a sundowner which included wine and freshly prepared snacks. This was my kind of wilderness experience. Because we were in a game reserve the rules stipulated we had to be back in camp by sundown. Evening game drives were not permitted. Also, we were not allowed to drive off the main tracks but Brian was very accommodating when required to better view animals as long as he did not encourage other vehicles to follow. Once we returned in the evening we freshened up and then had a superb meal personally presented by our camp chef Flo. We loved Flo. Her meals could have been served in any high end restaurant. Freshly prepared fruit salads, curries, roasted vegetables, local meats (kudu, chicken, beef, crocodile) simply seasoned but delicious and desserts to die for (cheesecake, puddings, chocolate mousse, freshly baked cookies and cupcakes). We then sat by the ever present campfire reviewing the adventures we had had that day. After an appropriate nightcap we ventured back to our tents and fell into blissful slumber with animal calls in the not too far distance. 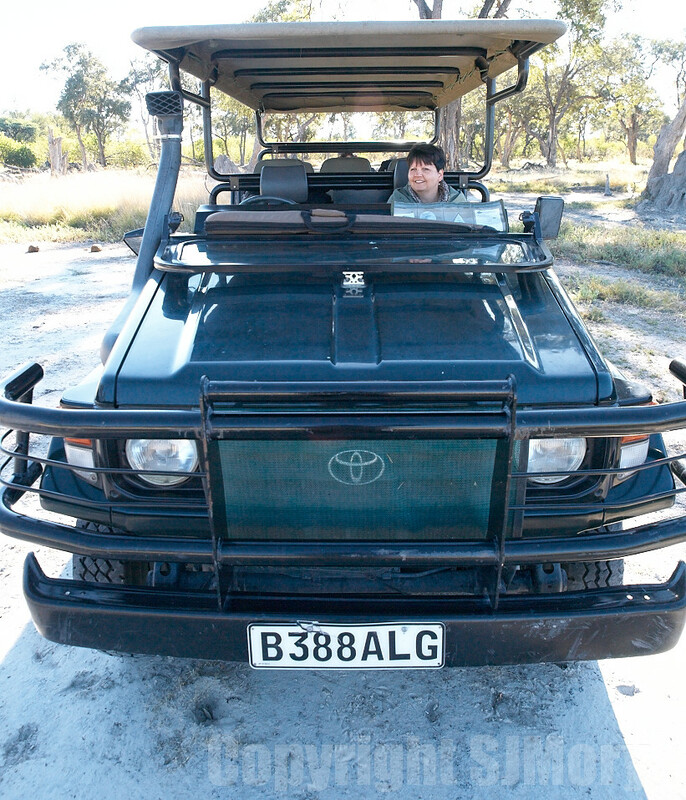 An open 4 wheel drive vehicle was used for all game viewing. Because there were only three of us, we had the ability to move back and forth to maximize our chances of getting photographs. Brian was very experienced in positioning the vehicle to get the best light which demonstrated to us his experience in dealing with photographers. You cannot realize how important this is in photography-light and location are everything. Clearly, African safaris are transitioning from the classic hunting camps to photography. I would say it is almost mandatory to have a naturalist guide. It is so easy to get lost and you often run onto roadways that are submerged in water making passage impossible. It was not an uncommon occurrence for us to pull out self drive vehicles that had ventured into water and then became stuck. After a while we thought we should’ve charged for our services. According to Brian, self drive touring- mainly by South Africans- is of concern to operators such as himself. Many of these individuals are inexperienced and often travel together which reduces the chances of having a true wildlife experience in addition to getting into all sorts of trouble. He does feel the fees for these individuals should be significantly increased to detract them from undertaking these ventures. I cannot believe how many animals we saw in this part of Botswana. In my next post I will provide pictures for you to enjoy.